Reconnect is a Charity NGO specialised in environmental education and research. As a Professional Chartered Environmental Engineer with more than ten years of experience and having worked on various sustainability projects in the developing world such as South Africa and Bangladesh, these experiences drove her to reflect on the fundamental problem with the way human interact with the environment. As such, Elizabeth is passionate about instilling positive value and teaching practical methods to solve real life environmental problems. Hence she found Reconnect with a mission to establish as a professional Environmental Institute to empower the next generation in tackling environmental problems through education and research. Always fancy being a creater of your own dream ecosystem? Having a headache preparing a heart-warming gift to surprise your sweetie, or treasure the moment creating an interesting thing altogether? 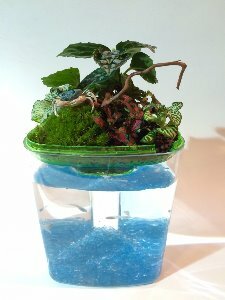 This fun and interactive workshop allows participants to DIY their own unique aquaponic system, suitable for presenting as a gift or decorating office and home. 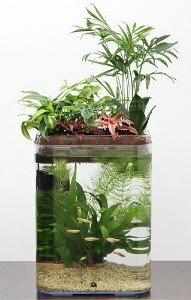 The harmonious relationship between the aquatic animals and the plants can bring energy and life to brighten any indoor environment, and at the same time recall ourselves about the mission of environmental protection. 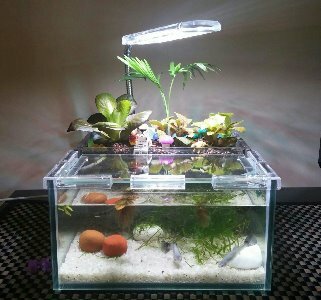 Aquaponic is an integrated system that keeps aquatic animal and plants in one system. The wastes generated by the aquatic animal provide nutrient for growing plants and the plants act as a natural filter to purify the water. 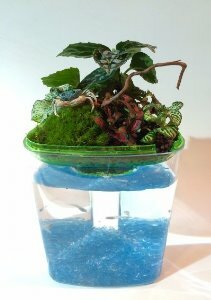 Don't miss out this chance to bring your own designed miniature aquaponic home! 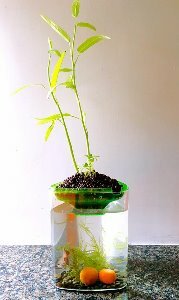 You can choose either plan omamental plant or vegetable on top of the aquaponic. Please mark it at Remarks field as well when registering. *The above pictures are all provided by Reconnect Limited. Enquiries: Please email to greenandculture@hkuaa.org.hk or call HKUAA Administration, at +852 2522-6113 . Please provide the name, email address and phone no. for each of you and your friends during the registration because of enrollment and administrative purpose.